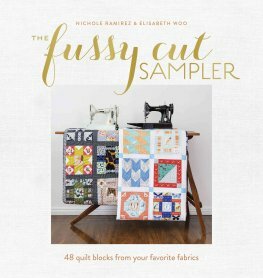 Late last year, my friend Elisabeth contacted me to ask if I'd like to participate in a blog hop for her yet-to-be-released book, The Fussy Cut Sampler, cowritten with her friend Nichole. I love a good bit of fussy cutting, so I knew it was something I'd love to participate in - and I'm so glad I did. This book is absolutely brilliant! 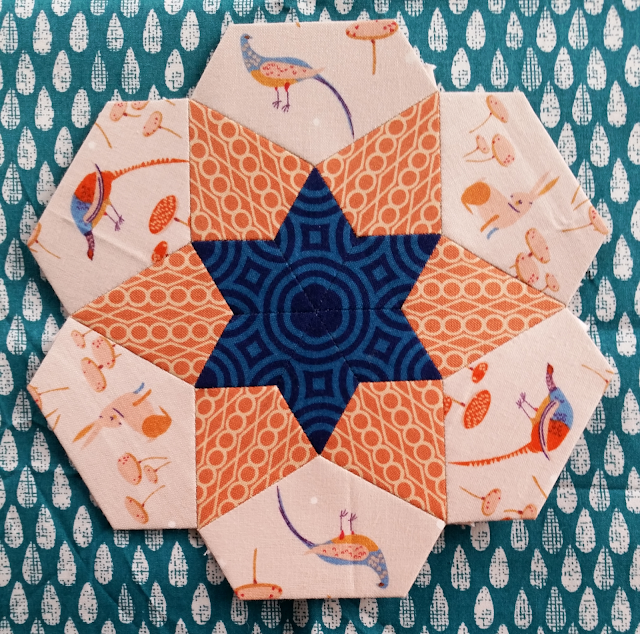 It goes way beyond just fussy cutting a square as a focal point in a quilt block - Elisabeth and Nichole talk in detail about how to use all sorts of different prints in quilt block. The block I'm sharing with you today is from Chapter 8 - Prints with Directionality. 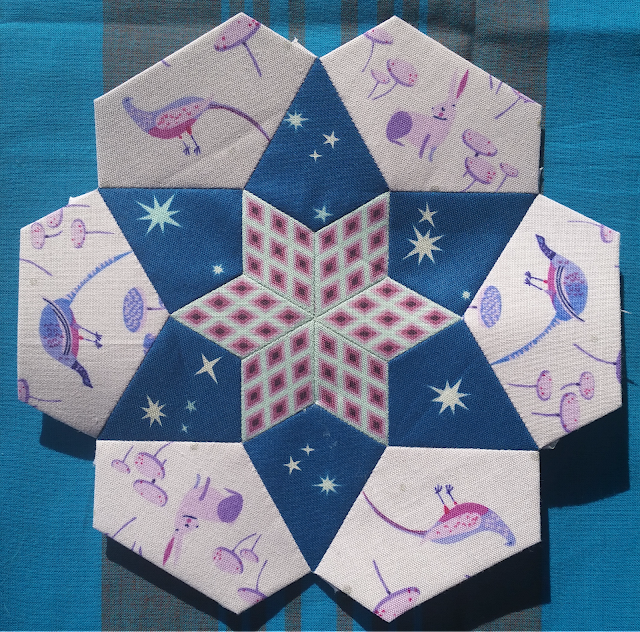 Directional prints can be quite difficult to use in quilt blocks, as they can be trickier to cut and make any piecing errors quite obvious. This chapter appealed to the obsessive aspects of my personality - precise cutting and piecing are two things I really, really enjoy doing, and they are critical when dealing with directional prints. Elisabeth and Nichole share loads of tips for dealing with directional prints, as either a focal or secondary (and even background) fabric. 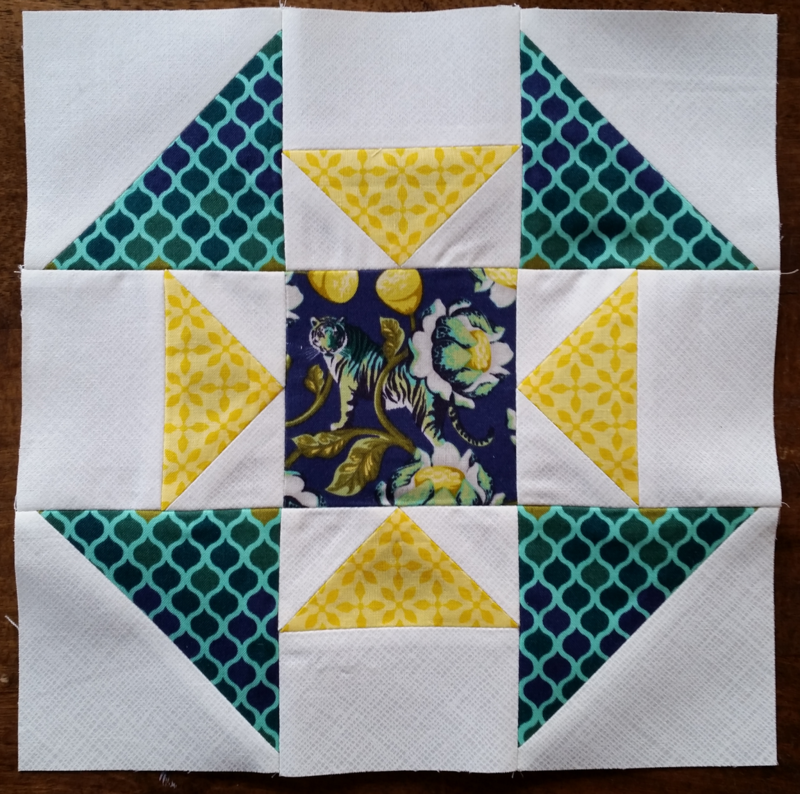 It took me a while to decide on what fabrics to use for this block - and it actually ended up being a group I'd put together for one of my yet-to-be-made Ice Cream Soda blocks (another great quilt for fussy cutting directional prints). I decided to use a couple of Tula Pink prints, which are always fun to fussy cut, along with one of my favorite prints from Jenean Morrison. 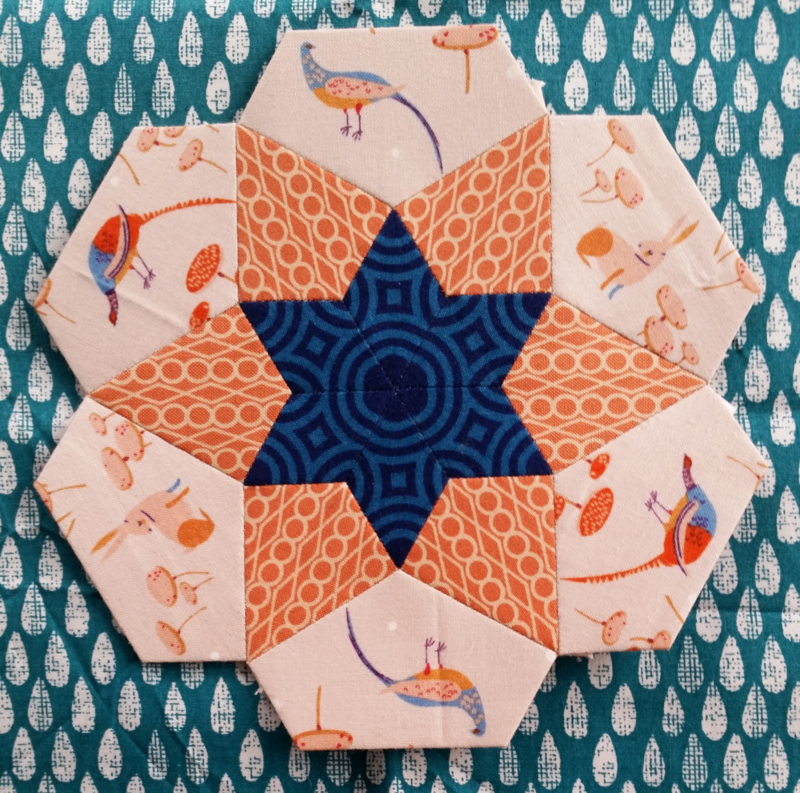 All three prints I chose are directional - and I've used them as both a focal print (the Tula tiger in the centre), and also as secondary fabrics (for the two groups of triangles surrounding the centre square). 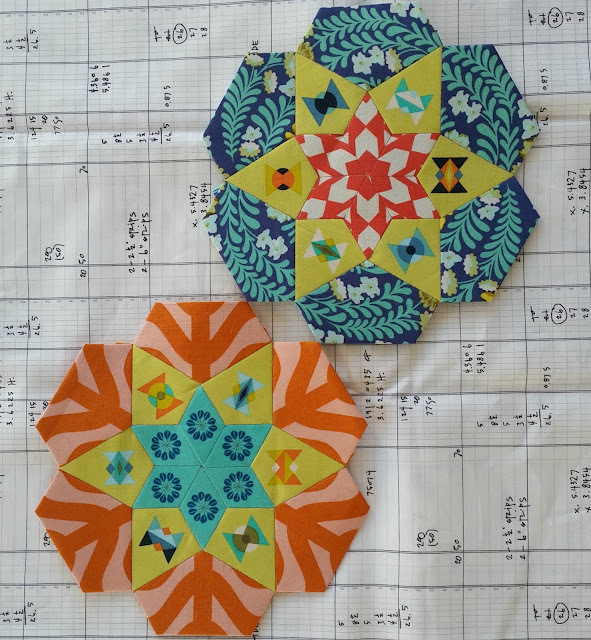 I was very careful when I cut my squares for the the half square triangle units, and again when sewing them with the background fabric, so that the print runs across the block. It took a bit of thought when trimming them to size too - I had to make sure the ochre part of the print was trimmed at about the same point for each HST. I think it was worth fussy cutting to this level - although if I made this block again, I would choose to have more of the ochre part of the print visible in the block. 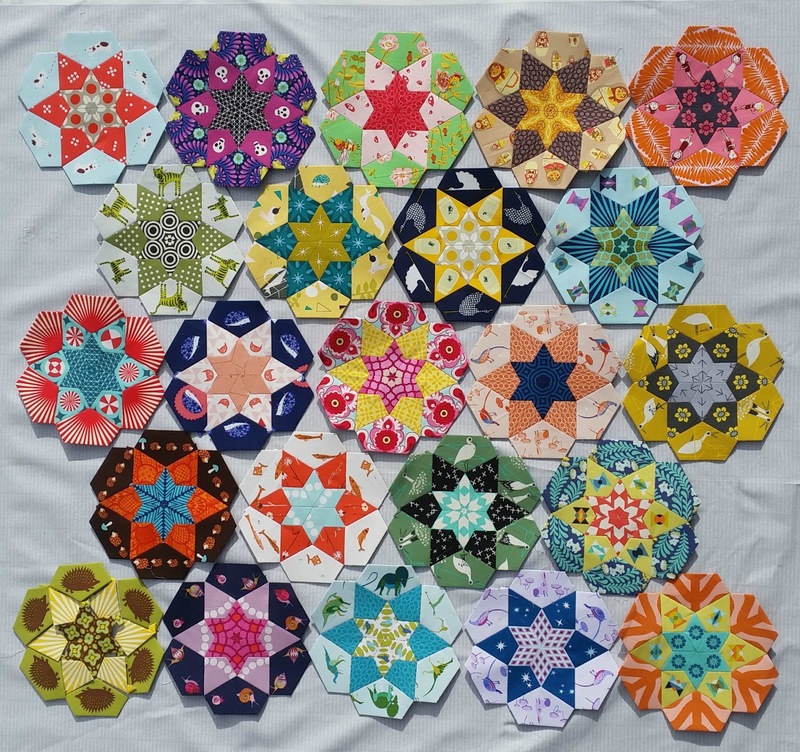 There is a great quilt along happening for The Fussy Cut Sampler at the moment, with some fabulous prizes to be won along the way. 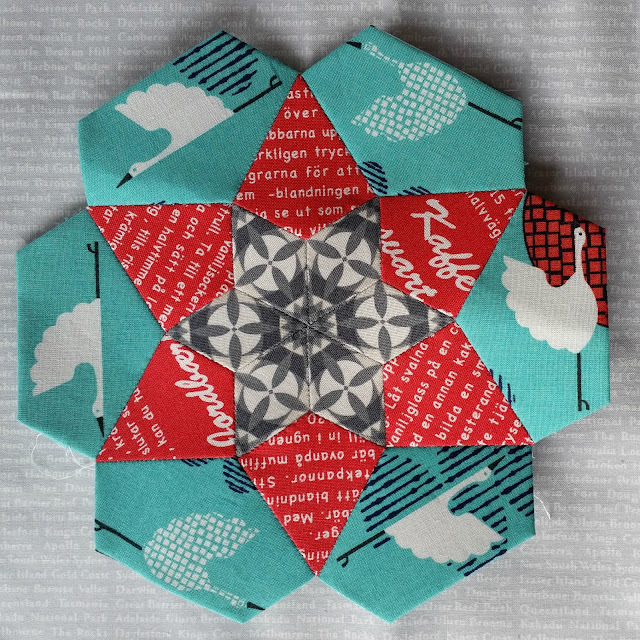 If you check out #thefussycutsampler and #thefussycutsamplerqal on Instagram, there is loads of inspiration to be found! I hope you're all having a great week! I'll be back soon (I hope!) with the beginnings of a few new projects :o). Today I'm excited to share a quilt I put together last month - the latest free pattern release as part of AGF Stitched, a collaboration between Art Gallery Fabrics and Fat Quarter Shop. 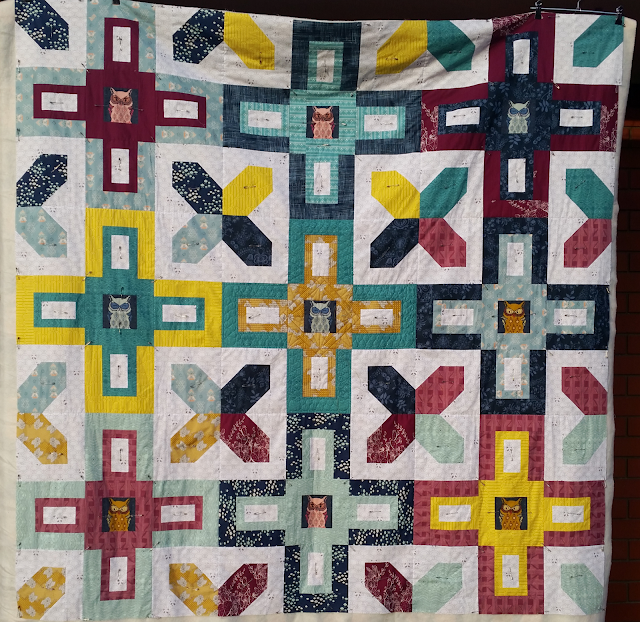 This was a really fast and fun quilt top put together - the blocks are big so it grows super fast. 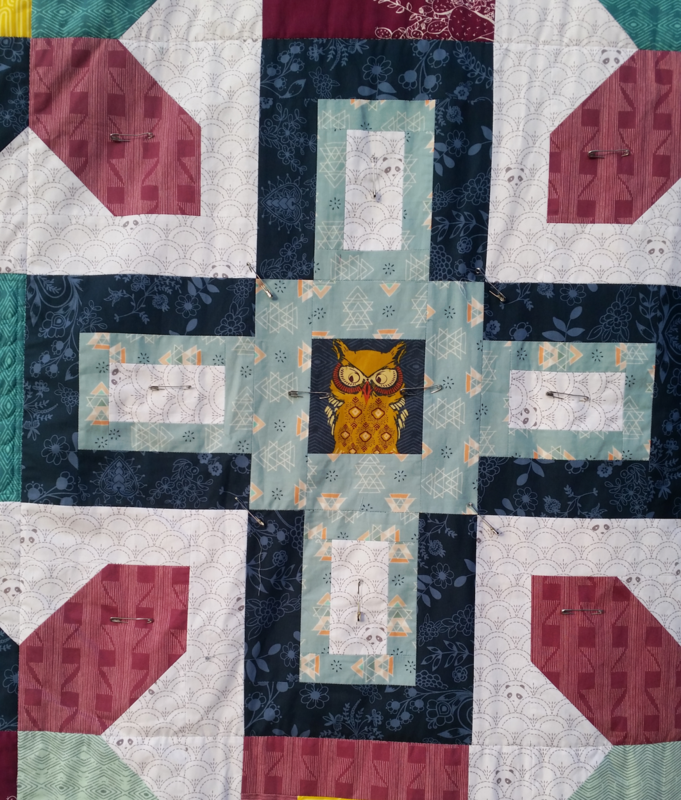 Plus, there are very few seams to match, so it's a very low stress quilt to make. I'd actually intended on only making one block and making it into a cushion, but I enjoyed making the first one so much I decided to make the whole quilt. I think this one will actually be for me to snuggle under on the sofa. And winter has hit pretty hard the last couple of weeks, so it would be nice to finish quilting it sooner rather than later ;o). Quite a few of the fabrics I used are from Nightfall by Maureen Cracknell, a gorgeous collection that features the owls I've fussy cut for the centre of the blocks. 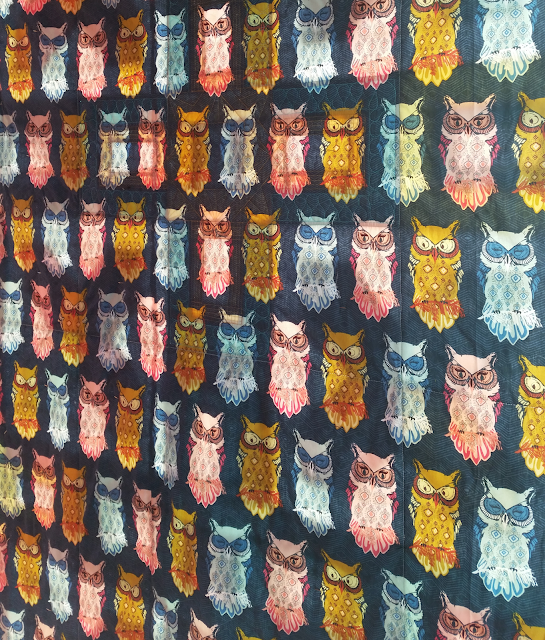 I also used the owl print on the back - so it's virtually a two-sided quilt. 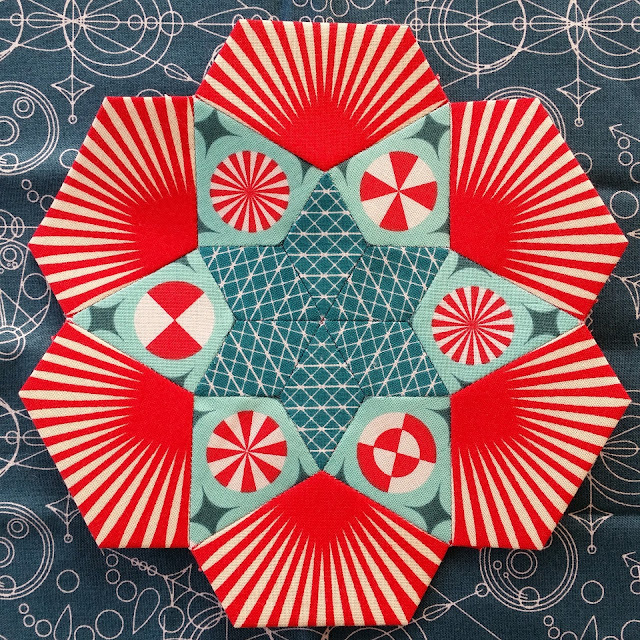 The low volume Pandalicious print I used for the background was so fun to use - I ended up deciding to cut the fabric so the print runs in the same direction across the whole quilt. It's only noticeable close up, but I think it would've irked me too much to not do it ;o). I have started quilting this one (which is why the pictures all feature basting pins), and I'm having fun with it. So far I've only done a bit of the centre block, and I've been playing with a few different weights of Aurifil thread. The ochre/yellow section is quilted with 28wt Aurifil - and I absolutely love the texture these heavier weight threads give it. I'm really looking forward to finishing this one off once I've gotten a couple of deadlines sorted out! 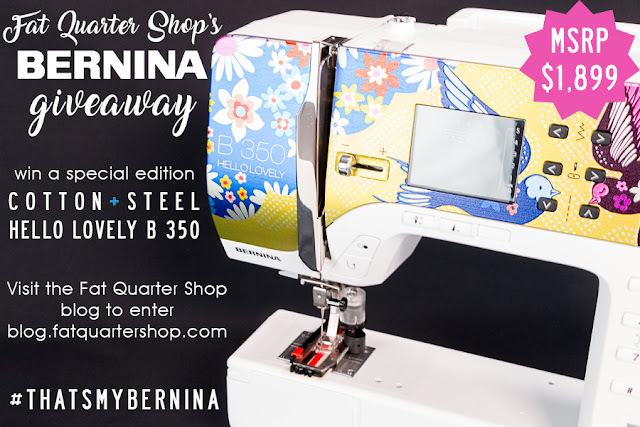 I really wanted to mention an awesome giveaway Fat Quarter Shop is running at the moment - a chance to win a Hello Lovely” Cotton + Steel B350SE sewing machine to give away, MSRP $1,899. 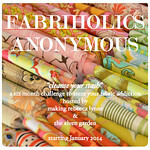 Head over to the Jolly Jabber for all the details on how to enter - and it is open internationally! 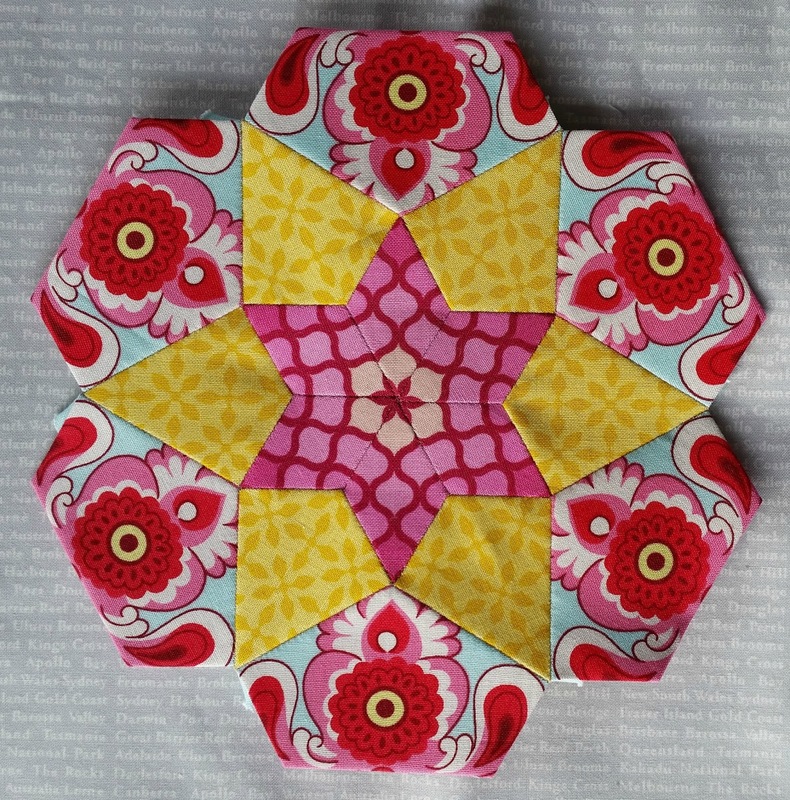 Have a great weekend, I'm hoping to be back soon with the beginnings of a couple of new quilts! 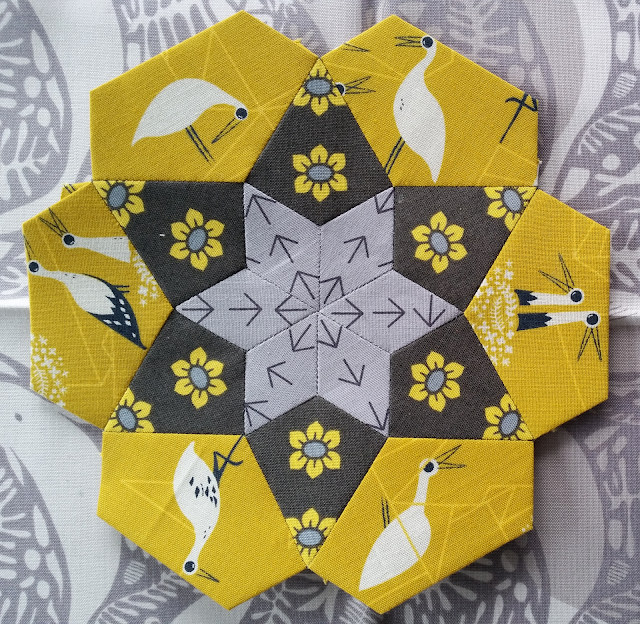 I'm sharing a quick little block with you today, one I put together earlier this week. This is a newly released pattern from Fat Quarter Shop, called Wild Goose Chase. The blocks in this quilt have been cleverly designed to incorporate Triangles on a Roll for making the flying geese units, and they make it so easy to put together. 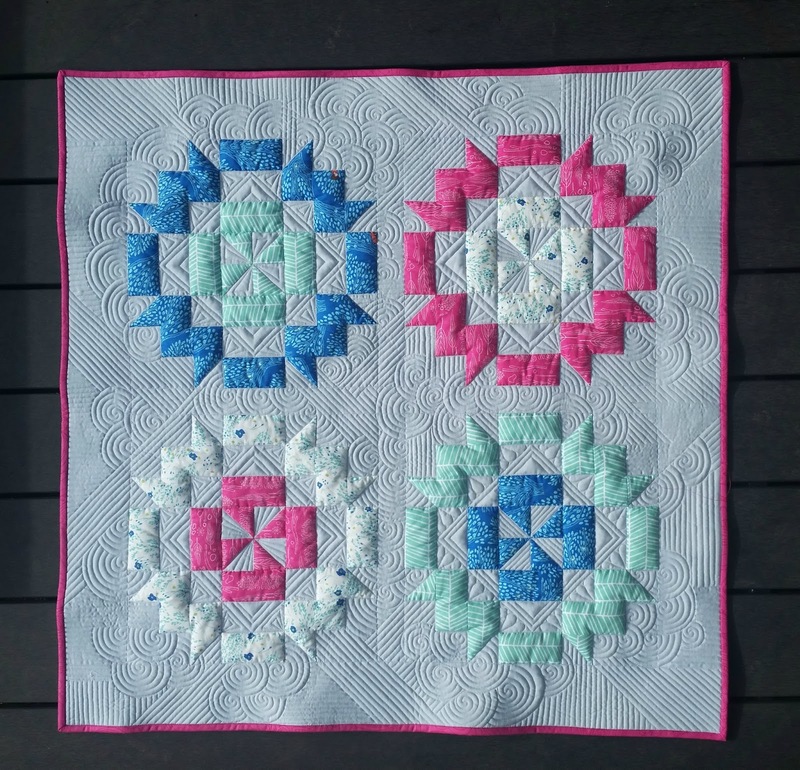 Although I've only had a chance to make one block, these colours are making me think a lovely summery quilt might be nice in the midst of winter. Apologies for a very brief blog post today - I've been in bed with an awful cold most of this week, and my head is still full of cotton wool! 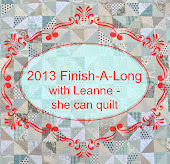 I'm really pleased to be sharing a finished quilt with you today! This quilt is made using a newly released pattern from the Fat Quarter Shop. 'Snail Trail' is part of a new Classic and Vintage series of pattern FQS are releasing, and I chose to make the Crib Size version. 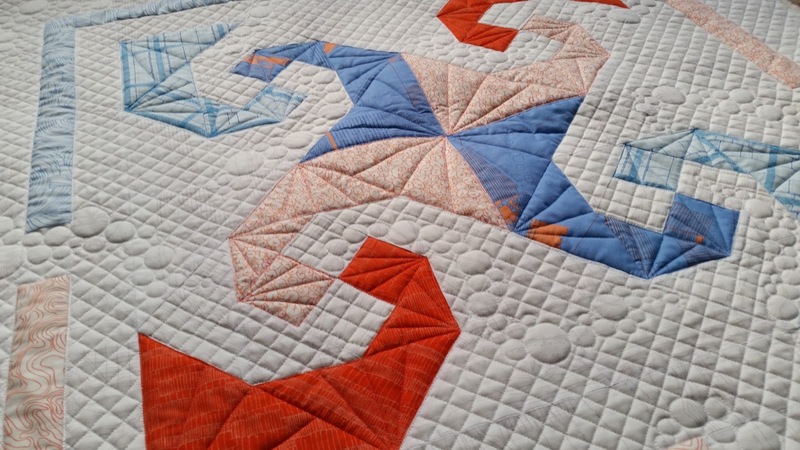 The Snail Trail block is one of my very favorite quilt blocks (and I have made at least four quilts using this block in the past), it gives such great movement to quilts. 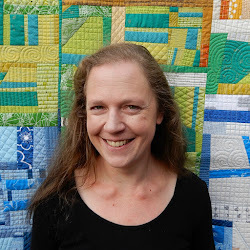 I used a variety of Carolyn Friedlander fabrics for this quilt, mostly from her recently released Friedlander Fabric collection, but also a few older prints (one is from her very first Architextures collection!) In the photo below, you can see the background is actually a grey on white print - I love using Carolyn's fabrics as backgrounds for a bit of subtle texture. 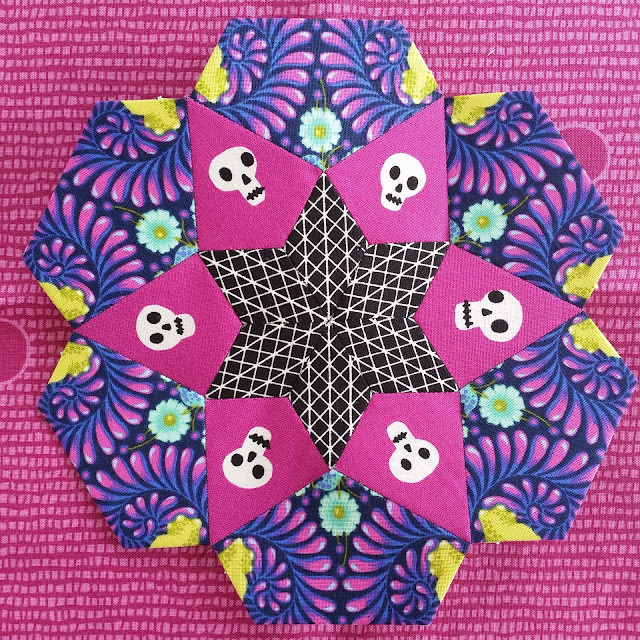 I made one small change to the pattern - I decided to piece the second border rather than using a single fabric. I love using a double layer of batting for small quilts (I love the added texture it gives to quilting), and since this one is only around 40" square, I jumped at the chance to go double. 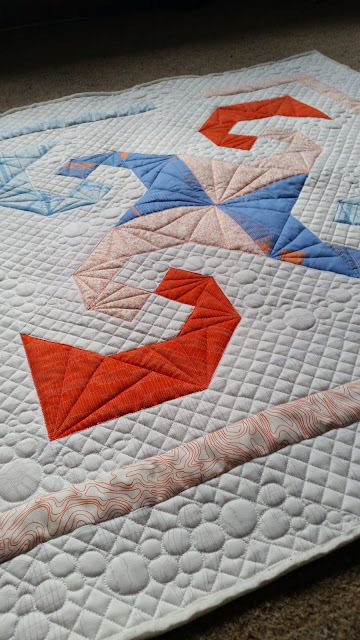 I chose some pretty simple free motion quilting designs for this quilt - pebbles and straight lines, with a free motion quilted 1/2" grid in the background. I love how the pebbles pop against the grid! 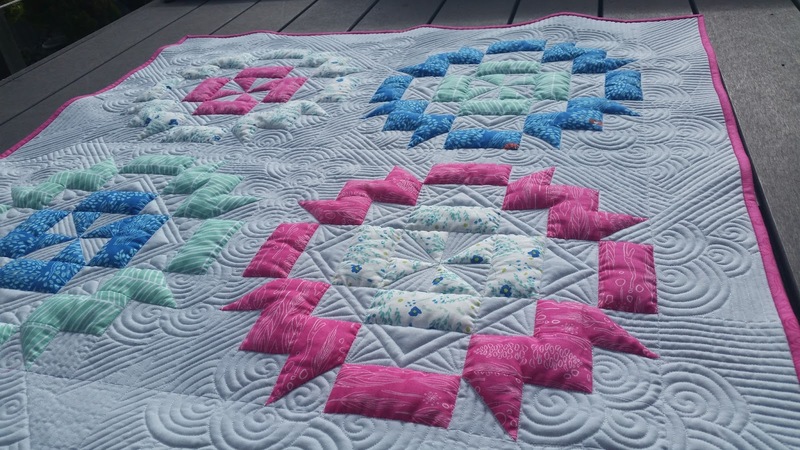 All the quilting is done in Aurifil 40wt threads. 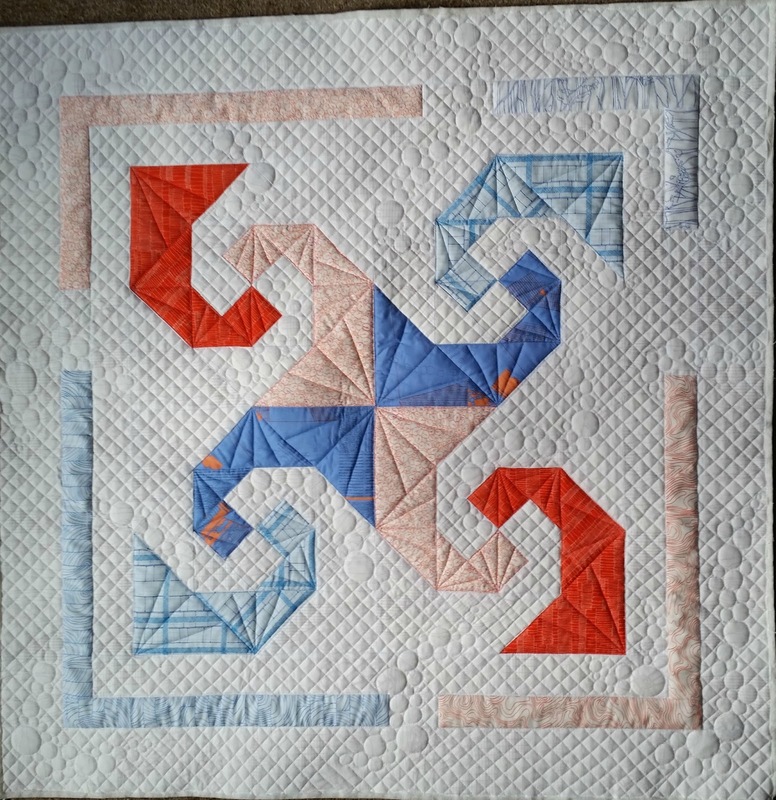 I chose white (2021) for the entire background, and then used a bright orange over the orange fabrics, and a variegated blue for the blues. 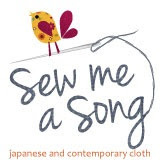 I realise I've been a bit quiet around the blog lately - not for lack of sewing, just lack of time for writing blog posts. So I'm hoping to be back in the next week or so to share some of what I've been up to! 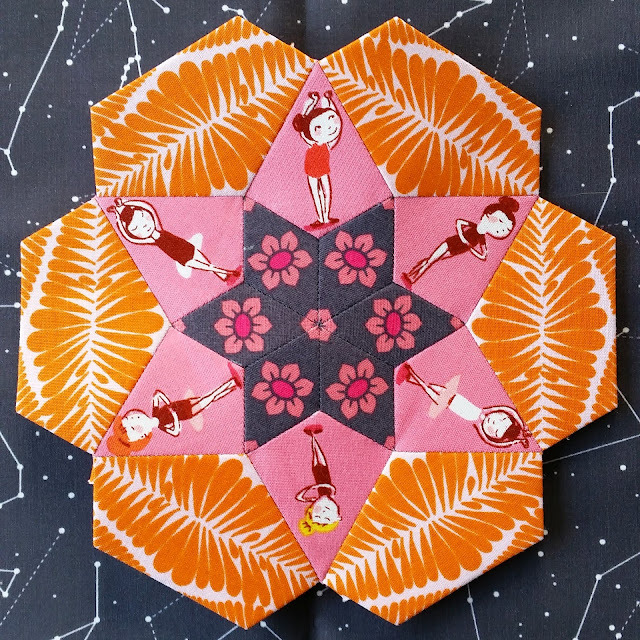 Another month, another lot of Ice Cream Soda quilt blossoms! 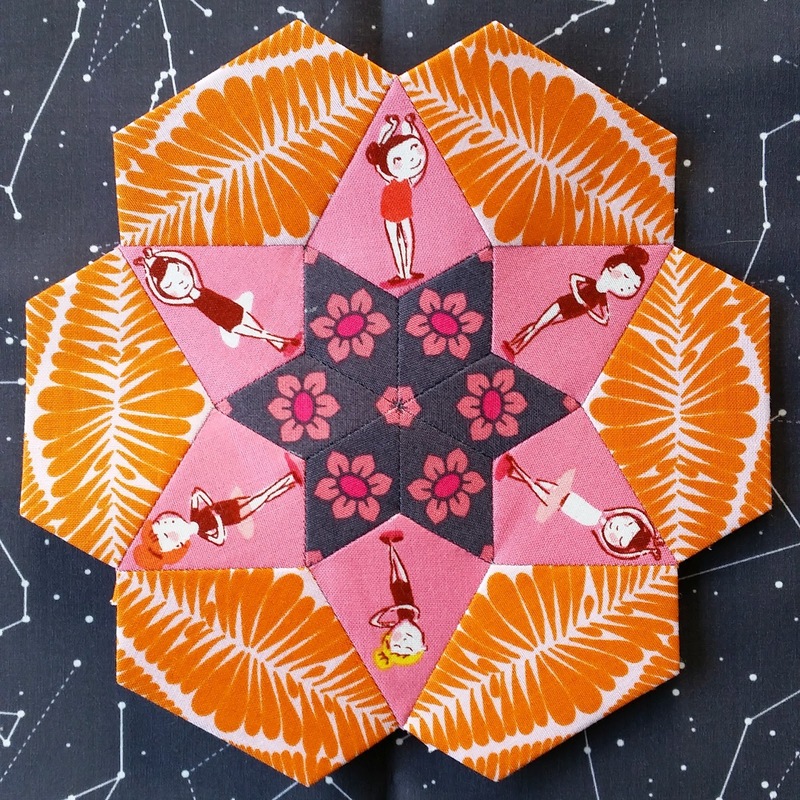 I'm still surprised that I'm 'keeping up' with this block of the month (created by Jodi at Tales of Cloth) - although I'm not making a conscious effort to get all my blossoms made before the next lot of papers arrive, it has worked out that way so far. Having said that, I've doubled my order for month four (I have a grand plan I'll talk about later in this post), and I'm pretty certain I won't get 16 done this month with everything else I have going on.... but we will see! This is how my blocks are looking at the moment (minus one - I need to get a good group photo!) Not totally balanced colour-wise, but I have lots of time to work on that little problem. I've been using Aurifil 80wt for pretty much all of my piecing for these blossoms. 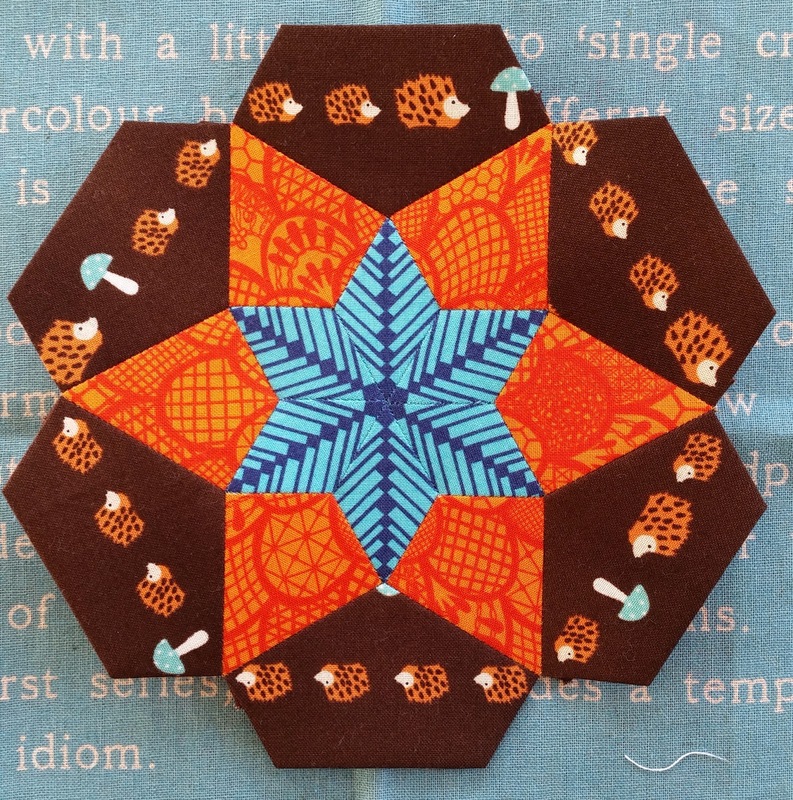 I think I've mentioned it before, but it is SUCH a revelation for hand piecing. I'm finding if I use an arm-length strand (not longer), it's stitching beautifully without breaking (even though I do put a fair bit of tension on my stitches). And the stitches are virtually invisible. I purchased the Essential Aurifil Applique set from Fat Quarter Shop earlier this year, and I'm finding this set of neutrals are meeting all my needs, even though I'm using a huge variety of colours and values in this quilt. I'm continuing with the fussy cut animal theme, although I am starting to make a few blocks that are just fussy cut (without the animal cute factor). I'm not sure about this one yet - but in among all the others, it works so I'm pretty sure it will make it into the final quilt. 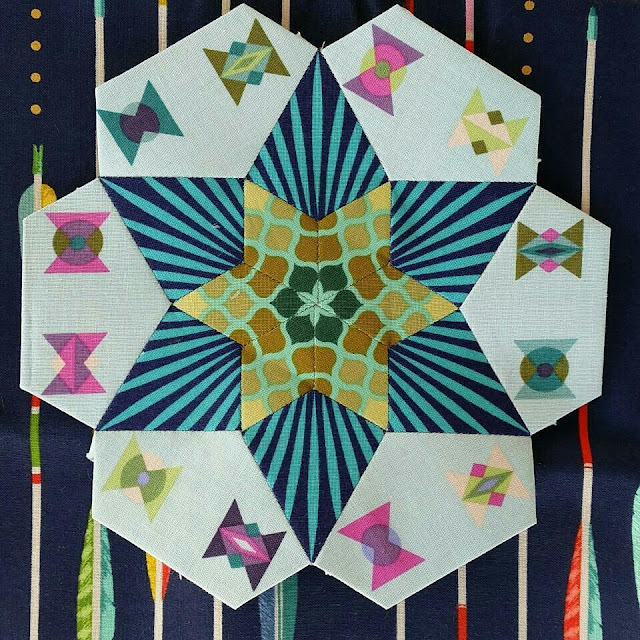 These two blocks were a bit of an experiement - I used the same Tula Pink print for the middle round, and varied the outer and inner prints. 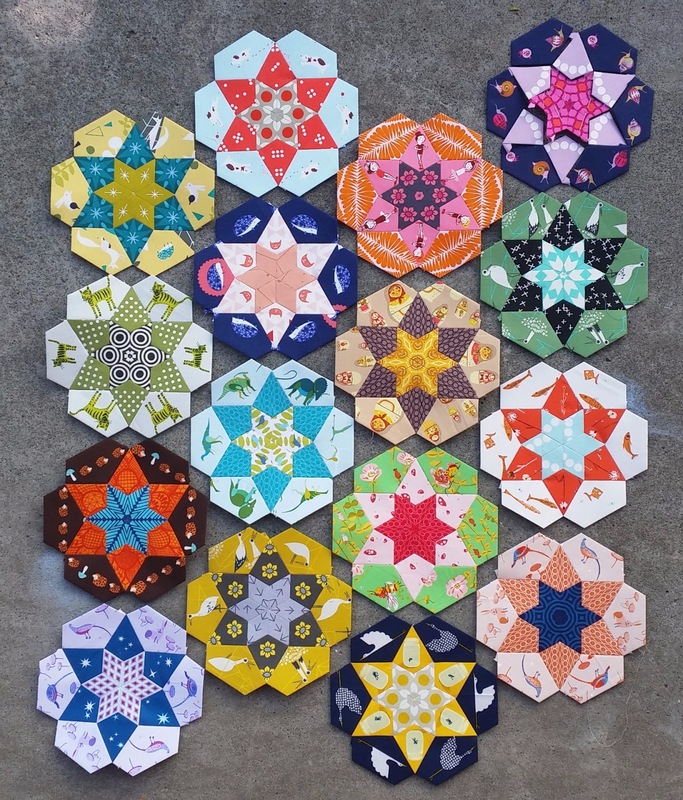 I'm amazed how different they look - and it's made me realise I'll easily be able to repeat fabrics in this quilt without it looking like I have. I've been having a lot of fun using this radiating stripe print from Heather Bailey's True Colours collection. I love the movement it gives, and how different it looks depending on where it's placed in the blossoms. 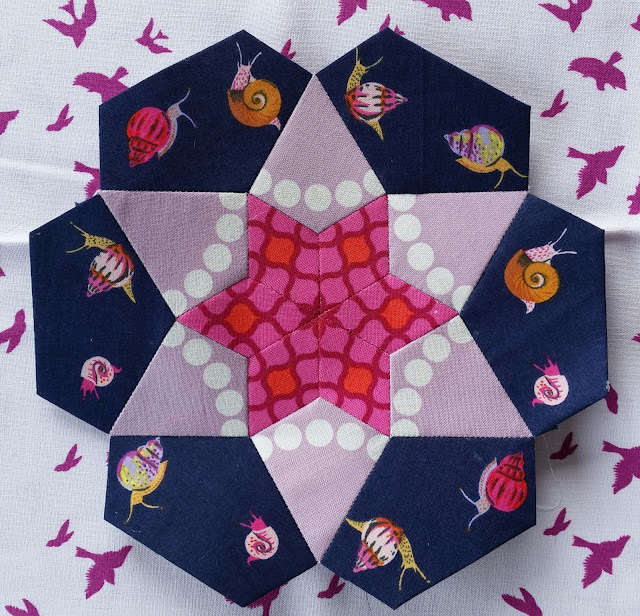 This month, I'm going to make a set of low contrast/low volume blossoms with the idea that my quilt might 'fade out' around the edges. We will see how it goes with my month 4 update in a few weeks ;o). April was a pretty busy month for me - my son turned 10, we had school holidays for a few weeks, plus throw in Easter, work and me learning how to use a longarm. Let's just say it was a full month! Nevertheless I managed to finish a few small projects, and I'm excited to be able to share one of these with you today. 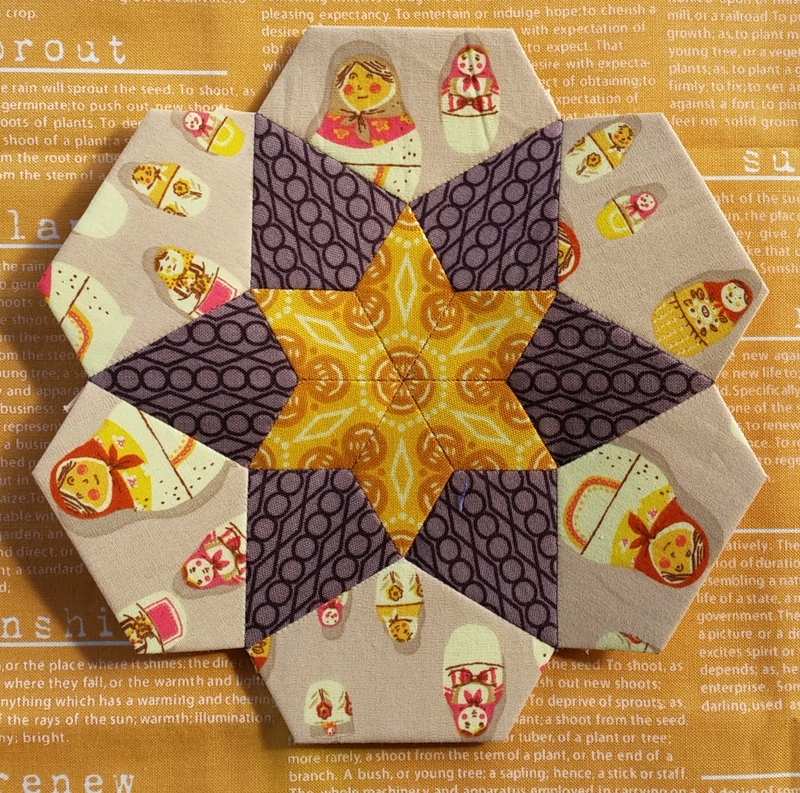 This is my version of the Peppermint Bark quilt, a brand new quilt pattern by It's Sew Emma for Fat Quarter Shop. 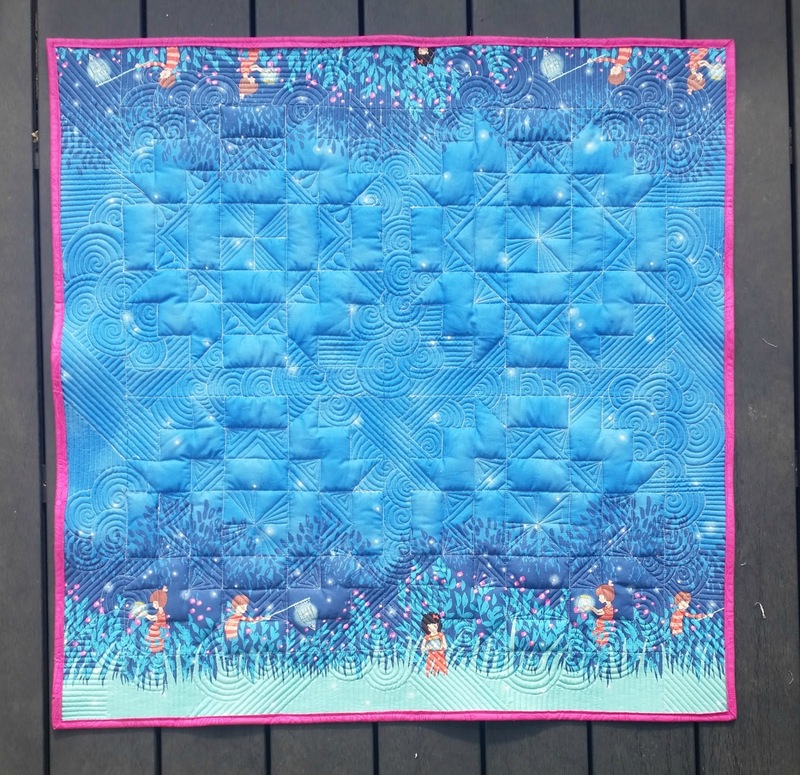 I made the crib-sized version of this quilt - and although I don't have any baby girls to give it to, it's the perfect playmat for my daughter to use when she's playing with her Sylvanian toys. I used a few prints by Sarah Jane I've been hoarding for ages (along with a Joel Dewberry herringbone print), and chose a grey solid for the background. 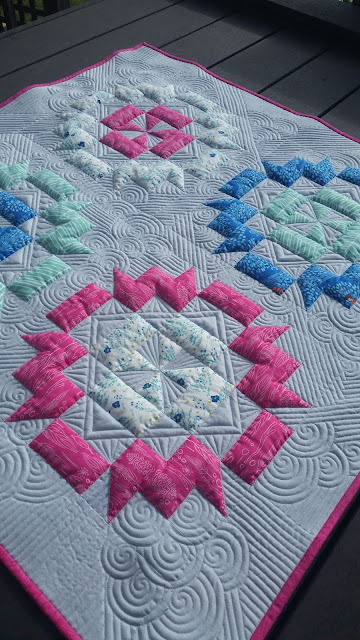 I deliberately chose a solid, as I knew I wanted to have some fun with the quilting on this one, and solids are awesome for showing up complex free motion quilting. It's a great pattern for small and medium scale prints - and these blocks sew together really fast. 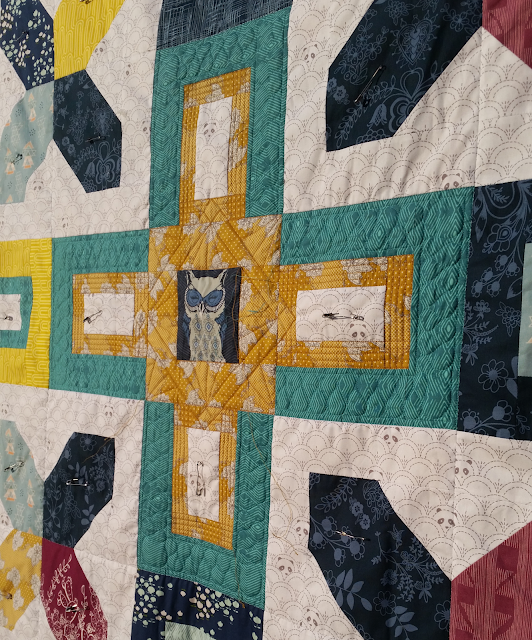 I used two layers of wool batting for this quilt, which is why there's that awesome puff in the unquilted areas. I love using two layers on small quilts, especially if the intention is that they're going to be used on the floor. Not only does it mean the quilting shows up wonderfully, it also means it's super comfy for kids to sit on while they're playing. All the quilting is done in my favorite 50wt Aurifil thread - Dove (2600). It has blended flawlessly into the grey solid, and just leaves all that lovely texture. I'll be back later this week with some very exciting news - and I'll have another finish to share next week (I just need to get the binding on it!). 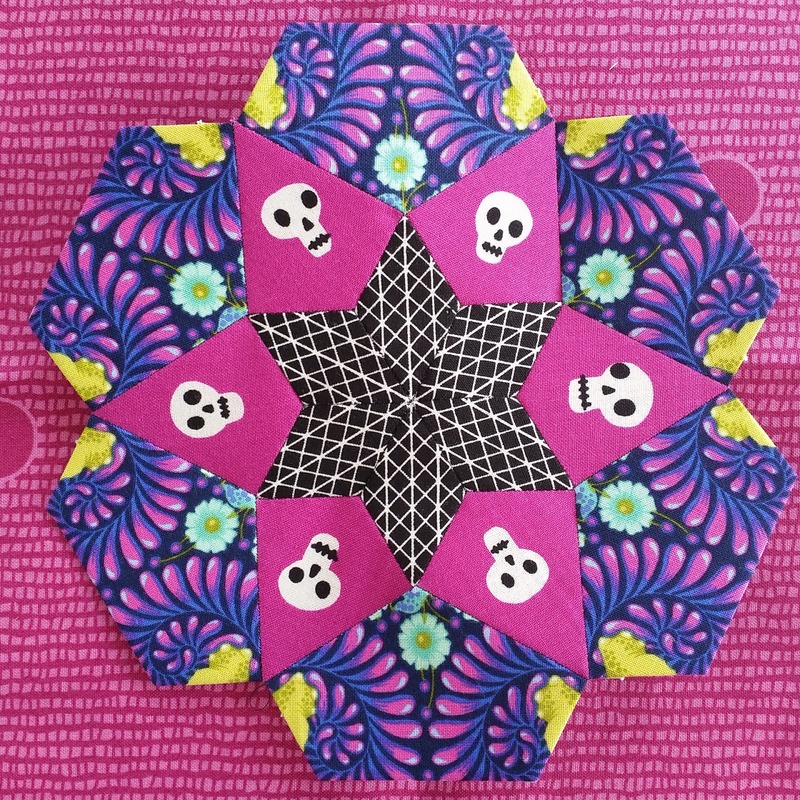 Another month, another set of eight Ice Cream Soda Quilt blossoms. And I am still absolutely loving this project! And exciting news for those of you who may have missed the sign ups back in February - Jodi has announced that she'll be opening up another round of sign ups in May, so if you're keen to join in on the fun, be sure to follow her over on Instagram. I'm finding it really helpful to take pictures of all these blossoms together every so often, to get a grip on what colours I'm lacking and to check that it is going to work overall. I love the fact that it is going to be super scrappy and look really unplanned, even though I'm carefully selecting and fussy cutting all the fabrics for each blossom. I need to concentrate on using more pinks, reds and purples this month, especially in the outer rings, to try to make it a bit more balanced. Like last month, I'm still using lots of my favorite designers - Lizzy House, Tula Pink, Heather Ross and Anna Maria Horner are all making frequent appearances. 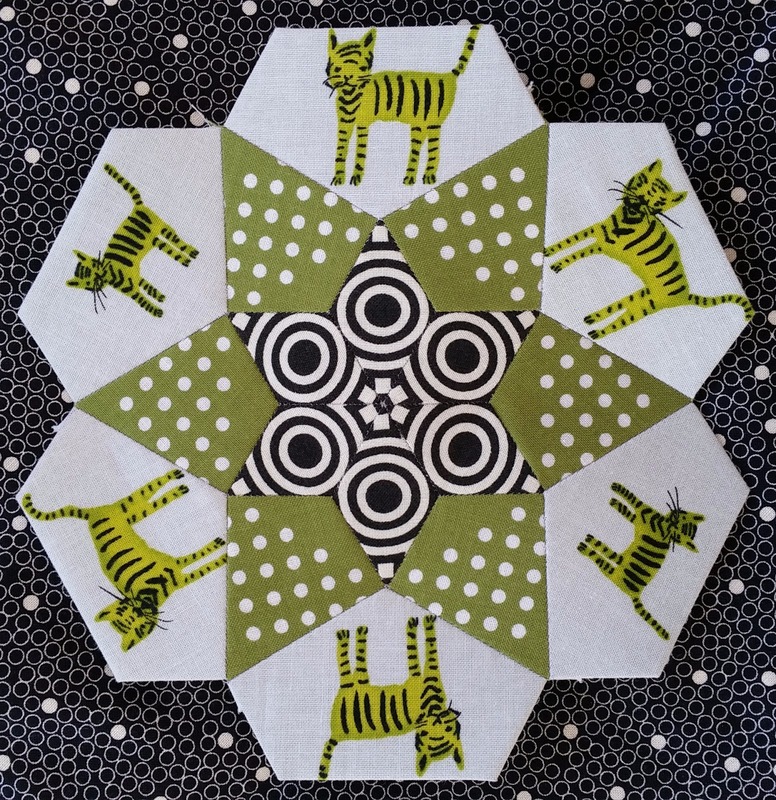 One of my favorite finds for this project has been Heather Bailey's True Colours collection. 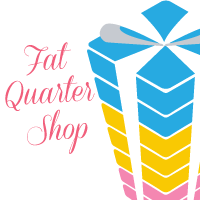 I bought a bundle of these from the Fat Quarter Shop (in one of their flash sales, so it was something like 50% off - bargain! ), and they are so perfect for fussy cutting. The centre of this blossom (one of my personal favorites) features one of these prints in the centre. 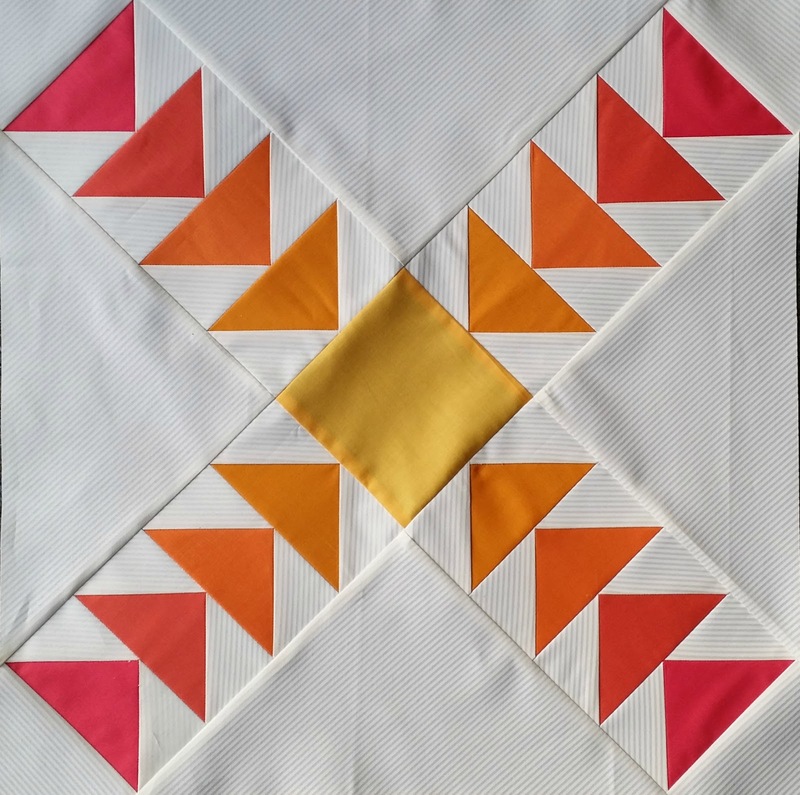 I find sometimes geometric prints are difficult to fussy cut, as they aren't always symmetrical. Not a problem with these, and I can see myself using them in lots of my blossoms. 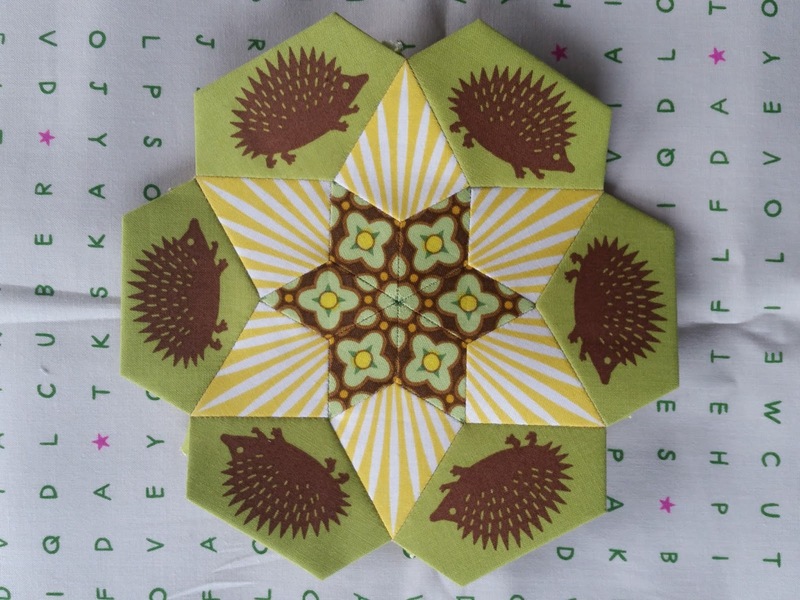 No colour is being ignored for this quilt - I'm even including brown (a totally underrated colour in my opinion!) I am SO in love with these hedgehogs wandering around the edge of this blossom! I wasn't sure about the centre of this one initially (deliberately cut so that the arrows are offset from each other), but it's really grown on me and I have decided I love it. I haven't forgotten about my promises of some English Paper Piecing tutorials either - between my middle child turning 10, Easter, school holidays, some secret sewing (plus work and life in general) I just haven't had time. But once school is back I plan to get them sorted! I have some other exciting news too. I've been practicing like mad quilting pantographs on a long arm at one of my local quilt shops, ready to offer customer quilting. So I'm extremely excited to announce that I'm now available to do edge to edge quilting for customers! 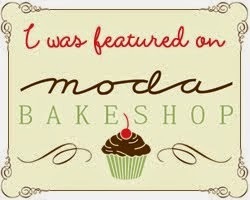 I'll share more details about that really soon! !